The price of ImportQIF is currently $17.00. The license of ImportQIF locks into a given machine so it needs to generate a computer code key that is used while purchasing an ImportQIF license. It is quite long, so you should use the Licensing... -> Purchase... to take you to the right web page, with the computer code filled in. With your purchase you are entitled to license files for 3 machines at the same time. 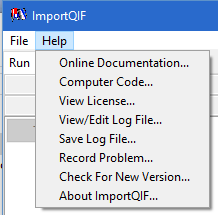 Your first license file will be sent to you when you purchase ImportQIF. To claim the other two you have to install ImportQIF on the other machine(s) and then select Licensing... -> Request Additional License File... This will take you to a the Request Additional License File web page to submit your request. The the computer code will be filled in automatically. Note you will need the User Id created for you from the purchase license to complete this request. run the full functionality of the utility, on up to 3 "configurations". A configuration is tied to one Windows operating system product. due to loss of data or any other reason. Copyright QuicknPerlWiz 2019. All rights reserved.